NEW YORK (Reuters) - Stock markets globally inched higher on Monday after China struck an upbeat tone as trade talks between the United States and Beijing resumed, though worries remained over the fate of Brexit. On Wall Street, the Dow Jones Industrial Average fell 53.22 points, or 0.21 percent, to 25,053.11, the S&P 500 gained 1.92 points, or 0.07 percent, to 2,709.8 and the Nasdaq Composite added 9.71 points, or 0.13 percent, to 7,307.91. 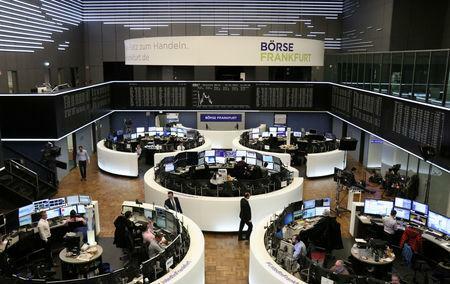 European markets closed higher, with the benchmark Stoxx 6000 index gaining 0.8 percent, while Chinese shares rose more than 1 percent on the first day of trading after the week-long Lunar New Year holiday. MSCI's gauge of stocks across the globe gained 0.03 percent. Worries about a slowdown in global growth, the U.S.-China trade dispute and the possibility of another U.S. government shutdown have been foremost on investors' minds. At the same time, Britain is due to leave the European Union in six weeks, though it still has no exit plan in place. Data on Monday showed the British economy grew last year at its slowest since 2012. China expressed hopes for a trade breakthrough as talks between the world's two largest economies resumed, though a U.S. Navy mission through the disputed South China Sea cast a shadow over the prospect for improved Beijing-Washington ties. U.S. benchmark 10-year notes last fell 7/32 in price to yield 2.6554 percent, compared with 2.63 percent late on Friday. The rising threat to growth means equity markets will focus on earnings from major U.S. companies for clues about the path of consumer shares. These include Coca-Cola Co, PepsiCo Inc, Walmart Inc, Home Depot Inc, Macy's Inc and Gap Inc.
U.S. crude <CLc1> was 0.6 percent lower at $52.40 per barrel. Brent was 1 percent lower at $61.48.